Eliza Dorothy Howe was the favourite daughter of John Howe of Litton and Ashford-in-the-Water (called "Poet of the Peak"). While working in Service in Manchester she received letters from John Howe 1823-31. At Bradbourne she married William DOXEY of Wirksworth in 1833, and later moved to Matlock. They had two children, William in 1838 and Alfred. 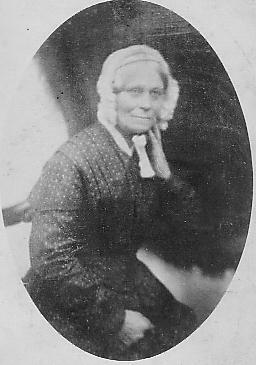 She worked as tallow chandler, cook, maker of umbrella tops and fustian coats, schoolmistress, trimmer of hosiery, shopkeeper and Toll gate keeper. In 1884-88 she wrote letters to her grandson, revealing her as an intelligent and delightful character. She died suddenly at 82 after a cold. From a photo by F Barber, 10 Orchard St, Church St, Sheffield.